"The Great American Dream of cruising down the parkway, zipping from here to there at any time has given way to a true nightmare that is destroying the environment, costing billions and deeply impacting our personal well-being. Getting from A to B has never been more difficult, expensive or miserable. It doesn't have to be this way. 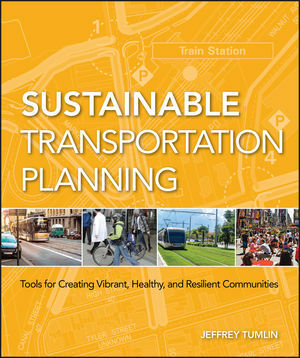 Jeffrey Tumlin's book Sustainable Transportation Planning offers easy-to-understand, clearly explained tips and techniques that will allow us to quite literally take back our roads. Essential reading for anyone who wants to drive our transportation system out of the gridlock." ?The book is full of useful ideas on nearly every page.? As transportations-related disciplines of urban planning, architecture, landscape architecture, urban economics, and social policy have undergone major internal reform efforts in recent decades Written in clear, easy-to-follow language, this book provides planning practitioners with the tools they need to achieve their cities? economic development, social equity and ecological sustainability goals. Starting with detailed advice for improving each mode of transportation, the book offers guidance on balancing the needs of each mode against each other, whether on a downtown street, or a small town neighborhood, or a regional network. JEFFREY TUMLIN is an owner and sustainability practice leader of Nelson\Nygaard Consulting Associates, a San Franciscobased transportation planning and engineering firm that focuses on sustainable mobility. Over the past nineteen years, he has led station-area, downtown, citywide, and campus plans, and he has delivered various lectures and classes in twenty U.S. states and five other countries. His major development projects have succeeded in reducing their traffic and CO² emissions by as much as 40% and have accommodated many millions of square feet of growth with no net increase in motor vehicle traffic. These projects have won awards from the General Services Administration, American Planning Association, American Society of Landscape Architects, Congress for the New Urbanism, and Urban Land Institute.